Here is a look at some of the top high school sports events this week. Monday — Coronado at Foothill, 6:30 p.m. The Southeast League still is up for grabs, but the Falcons could take a big step toward the title by knocking off the Cougars. 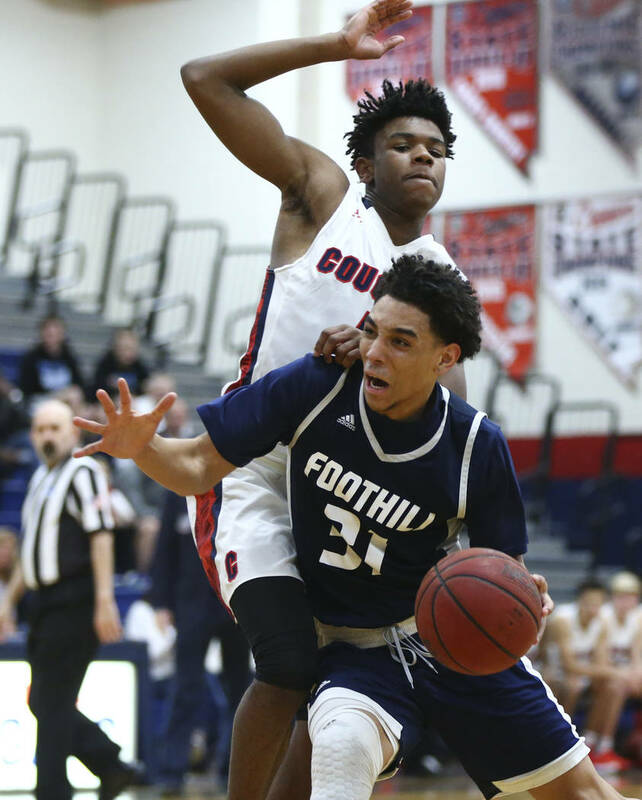 Wednesday — Centennial at Arbor View, 6:30 p.m.
Centennial is hoping to capture the Northwest League title, while Arbor View is looking to solidify a playoff spot. Wednesday — Liberty at Coronado, 6:30 p.m. Both teams enter the week 6-2 in the Southeast League, so this game could be for a home playoff berth. Thursday — Durango at Sierra Vista, 6:30 p.m. The Trailblazers and Mountain Lions both are 4-6 in the Southwest Leauge going into this one, so a postseason berth could be on the line. Thursday — Las Vegas at Canyon Springs, 6:30 p.m.
Canyon Springs has all but clinched the Northeast League title, but Las Vegas will be looking to avenge a 91-77 loss to the Pioneers on Jan. 24. Friday — Clark at Bishop Gorman, 6:30 p.m. The Southwest League playoff picture should come down to this game with the No. 2 Chargers traveling to play the top-ranked Gaels. 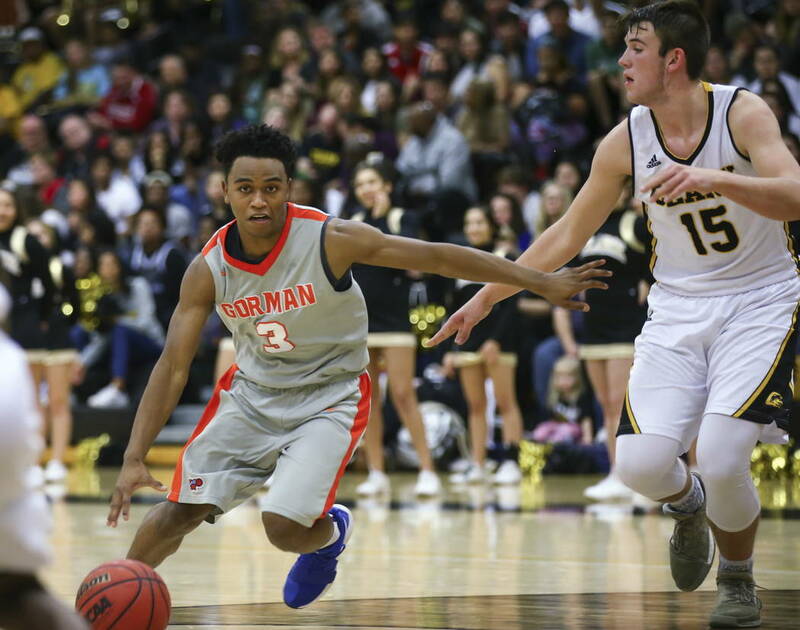 Gorman has beaten Clark twice this season. Monday — Arbor View at Legacy, 5 p.m.
Centennial may have the Northwest League locked up, but the Aggies visit the Longhorns in a key game with a No. 2 seed and a home playoff game on the line. Monday — Pahrump Valley at Cheyenne, 5 p.m. The Class 3A Sunset League is still up for grabs, and the Desert Shields would have a big leg if they can fend off the Trojans. Tuesday — Canyon Springs at Rancho, 5 p.m. This could be the top Northeast League game of the year, and the Rams could clinch the league title with a win. The Pioneers will look to avenge their 50-48 loss earlier this year. Monday — Cimarron-Memorial at Palo Verde, 4:30 p.m. The No. 3 Spartans travel to take on the second-ranked Panthers. Palo Verde currently is tied for first in the Northwest League with Shadow Ridge at 6-2 with Cimarron a game back. Wednesday — Arbor View at Shadow Ridge, 4:30 p.m. The 10th-ranked Aggies look to play spoiler against No. 5 Shadow Ridge. The Mustangs still are vying for the Northwest League’s top spot. Friday — All classes state championship meet at Orleans Arena, 9:30 a.m.
All three wrestling classes will meet at Orleans Arena as state champions will be crowned.